The story of American energy used to be we use too much. There’s not enough. And a technical breakthrough in clean alternatives will save us. How 20th century. The new narrative – really, it’s true — of American energy is this: We’re using less. A national boom in oil and gas production, engulfing 12 states from California to Pennsylvania and North Dakota to Texas, is showing we have much more than we thought. And the clean energy economy, tiny by comparison and roiled by uncertain markets, is still decades away. In no state are these trends colliding with more immediacy right now than in Ohio, which for years has been a modest oil and gas producer, and not long ago was widely viewed as a leader in passing legislation, promoting jobs, and installing manufacturing for a clean energy economy. Over the last year, though, everything in Ohio’s energy sector, like the nation’s, has changed. 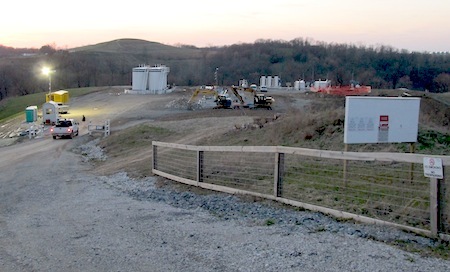 At night, on both sides of the upper Ohio River valley south of Pittsburgh, floodlights illuminate the laser-graded, table flat summits of steep Appalachian ridges that now serve as production pads for natural gas wells and processing plants (see pix from West Virginia side of river above). Drilling rigs 18 stories tall are starting to tap huge reserves beneath 17,000 square miles of eastern and central Ohio, beneath which lie two layers of deep gas and oil-bearing shale. Early production results from Columbiana, Carroll, Harrison, and Belmont counties show the first completed wells are capable of producing millions of cubic feet of gas and over 1,000 barrels of oil a day. Families are signing drilling leases that pay up to $5,800 an acre. Nearly $2 billion in new gas processing and transport facilities have been announced for sites in the Ohio River Valley. The economy of the 145 miles of river from Pittsburgh to Marietta, for two generations a laboratory of industrial ruin, is perking up. “It’s fantastic what this could do for this region,” said Sharon Davis, who owns a restaurant in Sardis, Ohio and recently earned up to $5,250 an acre for the 168 acres of minerals she and her family own in Monroe County. Meanwhile, a plan to build an offshore windfarm in Lake Erie, near Cleveland, has faltered. Another proposal to build a big wind farm in western Ohio was fought to a standstill by local residents, who filed a lawsuit that went all the way to the state Supreme Court. In January one of the state’s prominent solar manufacturing companies laid off half its workforce, and the chairman and founder of a second solar company resigned, leaving a skeletal staff and big debts. Cardinal Fastener, the Cleveland company that supplied bolts to wind turbine manufacturers, and which was visited by President-elect Obama in January 2009, declared bankruptcy last June, laid off most of the staff, and then was bought in November by a German manufacturer. It wasn’t very long ago, 2008 in fact, that clean energy production, and the development of a manufacturing sector to support it, represented a cogent business plan for Ohio, and other states interested in developing new jobs and contributing answers to environmental pollution and risks to national security. President Obama ran on a platform that responded to rising gas prices and industrial obsolescence with a clean energy, good jobs message. Four years later the president’s energy goals, like this state’s, reflect a convergence of technology, market opportunities, politics (“drill baby drill”) and policy that has elevated fossil fuel production to a top economic priority and weakened the glow of clean energy. President Obama now talks about an “all of the above” energy strategy, as he did in January in the State of the Union, when he hailed the fossil fuel sector for generating more natural gas than ever before and for relying “less on foreign oil than in any of the past 16 years.” Weeks later the president dispatched Interior Secretary Ken Salazar to Ohio to tour a manufacturing plant that is adding jobs to build the bulk tank trailers used to haul millions of gallons water to drill sites to hydro-frack the nation’s deep oil and gas-bearing shales. In the geography of Ohio’s energy sector, the contrast between the sagging fortunes of clean energy manufacturing and the boom in the fossil fuel industry is striking. In 2008, Ohio approved a renewable energy law that required utilities to purchase 25 percent of their power by 2025 from renewable and advanced energy sources. In 2010, the Environmental Law and Policy Center of the Midwest (ELPC), a Chicago-based nonprofit, counted 106 Ohio companies involved in supplying components for the wind industry, 63 supplying materials to the solar industry, and 7,500 workers in the state’s clean energy sector. It’s not that Ohio has stopped generating power from new renewable energy installations. Iberdrola Renewables is getting ready to open a 304-megawatt wind farm in western Ohio, where another company opened a 100-megawatt wind farm last year. A 50-megawatt solar installation is planned for southern Ohio, along with a manufacturing plant that wants to build the solar panels in a new factory in Toledo. The Solar Energy Industries Association reported this month that 1,855 megawatts of new photovoltaic capacity was installed in the U.S. last year, more than double the 887 megawatts installed in 2010. The American Wind Energy Association said that U.S. utilities installed 6,810 megawatts of wind capacity in 2011, a 31% increase from 2011. But Ohio solar energy manufacturers, like others in the West – the Solyndra failure in California last year has become a presidential campaign issue — are going out of business. Wind energy suppliers are laying off workers. Competition from foreign manufacturers, from low prices for natural gas, which is steadily replacing coal as a favored fuel for electrical generation, and from uncertainty in renewing the federal production tax credit for wind power are blamed. Iberdrola Renewables laid off 50 of its 900-member staff in January and the company’s executives say an amendment to Ohio’s renewable energy law would make it much harder to finance new wind farms in the state. The proposal, which Republican Governor John Kasich supports, would enable AK Steel, an Ohio steelmaker, to use state renewable energy credits to develop electricity from waste gases from its blast furnace. The co-generation project, notes Eric Thumma, Iberdrola’s director of policy and regulatory affairs, is itself fueled in part by non-renewable natural gas. AK Steel’s co-generation technology, the company asserts, fits into clean and renewable energy development in Ohio. The U.S. Department of Energy has already approved a $30 million grant for the project. Gov. Kasich, who has introduced a new state energy plan that emphasizes fossil fuel production, has said repeatedly that using waste heat or gases from industrial processes to generate electricity should qualify for renewable energy credits. But there is already more than enough wind energy online and planned, says Thumma, to soak up the available credits. The AK Steel project would add 100 megawatts of new power to the already saturated market and essentially render the renewable credits worthless. “It will crash the market for wind as a renewable energy in Ohio,” said Thumma. Contrast the unsettled economic geography of Ohio’s renewable energy industry with the massing industrialization by the state’s fossil fuel sector. Some $3 billion, according to the Ohio Department of Natural Resources, is being spent on drilling and production, pipeline construction and supply chain manufacturing to serve the fossil fuel sector. One new steel plant is opening in Youngstown, and three others in Lorain and Canton are expanding to meet demand for drilling pipe and other equipment made of steel in and outside Ohio. It takes a lot of steel to tap Ohio’s 4,000-foot deep Marcellus shale, and 2,000 feet below it, the Utica shale. Geologists in state government say the Marcellus contains trillions of recoverable feet of natural gas, a good deal of it so-called wet gas that produces ethane, propane, and other compounds that can be easily processed into valuable fuels and feed stock chemicals for rubber and plastics. Royal Dutch Shell, this month, announced that an upper Ohio River site, just across the state border, in Monaca, Pa. is its favored site to build a multi-billion dollar plant to convert natural gas to ethylene and other feed stock chemicals. The Utica shale may be even more valuable, say state geologists, because it holds 15.7 trillion cubic feet of gas, and 5.5 billion barrels of recoverable oil. As of March 11, the state had issued 172 drilling permits, all but 13 for the Utica play, and 57 wells had been drilled, using the horizontal drilling and hydro-fracking. Because fracking requires so much water, a good deal of which comes back to the surface contaminated with hydrocarbons and chemicals, wastewater disposal from the oilfield is a big challenge. Ohio requires the wastewater to be recycled or disposed in deep injection wells. This month, in a step that seemed to confirm the governor’s pledge to be vigilant, the Ohio Department of Natural Resources (ODNR) imposed tough new regulations on the operators of the state’s 177 deep injection wastewater disposal wells. The new rules, prompted by earthquakes last year that were centered around a year-old injection well in Youngstown used to dispose of wastewater from hydro-fracked wells, will make Ohio’s Class II deep-injection wells among the most stringently monitored and regulated in the nation. State regulatory infrastructure will be tested in Ohio, as it is in other states. Similarly dense, hydrocarbon-rich shales lie beneath much of the rest of the country, and are being tapped at a frantic pace. Last year, according to the Department of Energy’s Energy Information Administration, the number of oil and gas drilling rigs in operation across the U.S. reached an average of 1,865 a month. That is the highest rig count since 2008, according to the EIA. More than 20,000 oil wells were drilled in the U.S. in 2011, higher than any year since 1985. The deep shales, moreover, are almost a can’t miss opportunity, Of the more than 40,000 oil and gas wells drilled in 2011, said the EIA, almost 90 percent produced marketable quantities of fuel. Natural gas production last year set a record, a third of it from deep shale, and in December oil production climbed to 5.88 million barrels per day, the highest since December 2001. From the ridge summits high above the upper Ohio, on an unseasonably warm day late in a winter that wasn’t, some of the equally profound risks of perpetuating America’s fossil fuel economy also are visible. The growl of bulldozers clearing trees for new roads and drill pads can be heard across a landscape that consists of miles of unbroken forests and is now being fragmented. Wide and muddy corridors have been cut up and down steep hillsides for pipelines that gather natural gas for transport to processing stations. Erosion is increasing and pouring mud into the region’s streams. Big trucks, pouring diesel exhaust into the air, strain in low gear to haul equipment and frack water up narrow roads with such acute grades that in the West Virginia gasfield near Martinsville, authorities require they be escorted to limit traffic accidents. An edited version of the article was posted by Yale Environment 360 on March 29, 2012.